As the automotive market seemingly takes design more and more toward a sporty style regardless of performance, VW retains its understated and sophisticated aesthetic with its 2016 Volkswagen Passat in Las Vegas NV. 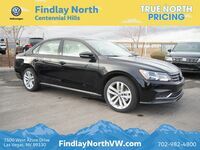 For this model year it has received an updated look to make it even more attractive, and those who step onto the Findlay North Volkswagen lot have remarked that there’s just something about it. The looks are all about refinement that get it noticed, without calling forth any negative attention. Looks alone can’t cut it for our customers, but style isn’t all that the Passat is offering. Its base engine is a 1.8-liter turbo four that delivers 170 horsepower and 184 pound-feet of torque which returns a dynamic driving style while retaining impressive fuel economy numbers. The base model gets an EPA-estimated 25 city and 38 highway mpg, while upgrading to the potent 280 horsepower V6 engine with the standard six-speed DSG automatic transmission returns a 20 city and 28 highway mpg rating. The first thing you’ll notice when comparing the new Passat to last year’s model is the tweaks to its style. The mid-cycle refresh includes a new sculpted domed hood to give it a slightly more aggressive appearance, a more substantial four-bar chrome grille and slimmer headlights, plus a new R-Line trim. There are two engine options available for the 2016 VW Passat, with the standard 1.8 liter turbocharged engine delivering 170 horsepower and 184 pound-feet of torque. The 3.6-liter V6 ups the ante by squeezing out an impressive 280 horsepower and 258 pound-feet of torque from the midsize sedan. One of the major draws of the 2016 Volkswagen Passat is its balance between the features, styling and premium feel shoppers want, without going so overboard that it loses its affordable price tag. Standard in the model are automatic headlights, Bluetooth, a 5-inch touchscreen and dual-zone climate control. What’s new for the 2016 Volkswagen Passat? Even when a vehicle is between cycles, it doesn’t mean it has to offer the same old stuff year after year. This is obvious when looking at the 2016 Volkswagen Passat, which has received a new look that gives it a more sophisticated appearance than ever before, while also adding new features to bring even more value to the model. The first thing most VW enthusiasts will note is the new hood, which has a chiseled new hood to bring a bolder presence to its design. Chrome accents along the front bumper, window surrounds and door trims add an expensive appearance, without actually resulting in luxury pricing. Other new features include an updated interior with a new dashboard and center console, two-tone décor panels, a new steering wheel design, an available frameless auto-dimming rearview mirror, the MIB II infotainment system with available App-Connect features and a whole host of driver assistance options to make this family vehicle safer than ever. For more information on the 2016 Volkswagen Passat, the model can be taken for a test drive at Findlay North Volkswagen, serving Henderson and Las Vegas, NV.